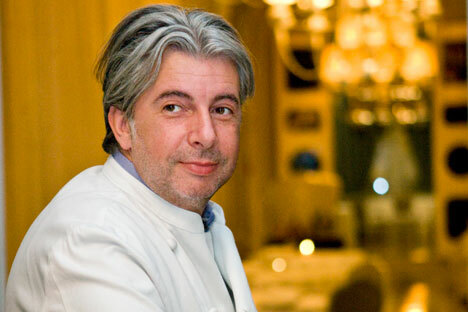 The first chef to bring the world a modern twist on Russian cuisine, Anatoly Komm is the only Russian chef to have a restaurant (Green, just outside Geneva) listed in the Michelin Guide and to win – with his Moscow restaurant Varvary – an entry in the World's 50 Best Restaurants 2011. He opens his new project, Anatoly Komm for Raff House, in Moscow on Feb. 11. RBTH caught Komm during a quiet moment to talk about his new restaurant, the cuisines of the world and his culinary tours. RBTH: What will be new in your restaurant? RBTH: You were the first to make Russians themselves believe in the future of their national cuisine. But you got in the Michelin Guide with your restaurant Green, near Geneva. A.K. : I wanted to win in an away game. It would have been bound to receive its first star within a year, but there was no sense waiting – I wanted to work in Russia. Unfortunately, I ended up being the only one. It doesn't flatter me; one man makes no team. When the Scandinavians broke through in the market, it was not one René Redzepi, it was a team. He soared high because he had 10 to 15 well-known chefs behind his back. And while now Peru and Mexico are setting the trend in the restaurant world, it’s also the case that there’s not just one or two chefs there. RBTH: And you are always up to date with trends. Do you often travel around the world? A.K. : I'm always on the road. The most recent tour was in the capital of French cuisine, Lyon – it was a dinner organized for prominent chefs. RBTH: Did you cook it Russian-style? A.K. : Yes, it was absolutely my cuisine, Russian produce. Eight years ago, when I said that I would cook with local produce, everybody made the ‘cuckoo’ sign and asked, "Why would you?" Now there are chefs who consciously cook using what is grown here. I enjoy the fact that I’ve made my modest contribution. They used to say that I was crazy when I started to stage ‘gastro shows’, and now everyone uses this term. It means that everything evolves. I'm just a little ahead of my time. For me, gastro shows are in the past. Even if in the rest of the world they are not – if you come to all the major restaurants, you will get nothing but "shows". RBTH: Many ‘Michelin’ chefs are now opening brasseries. A.K. : But even there you will get nothing but a "menu" – a set of certain dishes, arranged in the ‘theatrical’ order. You will not be able to order anything a la carte. In my new restaurant there will nothing but a la carte. However, I planned the menu in such a way that you will be able to create your own ‘show’. RBTH: You are opening a restaurant, but don't stop touring. How so? A.K. : When [leading Russian conductor] Gergiev is on tour, they don't cancel performances at the Mariinsky [Theater], do they? That's a bold comparison, but nevertheless... There is American ex-chef Anthony Bourdain: a TV presenter, the author of several books. In Medium Raw, he wrote: “If you think that famous chefs are always in their restaurants, you're wrong. Their schedule is made in such a way that, while you are dining in their establishments, they are most likely flying off somewhere.” And that's true. As for the team ... Like fine musicians, my guys play all the notes. RBTH: When do you go on tour next? A.K. : After the opening, I'll resume touring in April. First, it's the closing of the ski season at Zermatt Palace in Switzerland. In May I'll go to the World Gourmet Summit in Singapore, where we'll organize a gala dinner in addition to the workshop. RBTH: How many times a year do you usually tour? A.K. : From 12 to 20. RBTH: Do all the seats sell out when you're touring? A.K. : There aren’t even enough of them. There was an occasion a few years ago: I had a tour of Les Airelles in Courchevel; they sold 157 tickets for the dinner, but there were only 90 seats in the restaurant. To seat all the guests, the organizers had to rent a nearby restaurant owned by the famous Pierre Gagnaire as well. RBTH: Do you have any favorite restaurants abroad? Which are the most important for you? A.K. : There are loads! In Sao Paulo – D.O.M., in France – L'Astrance, in Denmark – Noma, even if Nordic cuisine does not interest me, I don't see any development there. The fact that Norway won the most recent edition of the Bocuse d'Or [one of the world’s leading chef competitions – RBTH] seems absolutely unfair to me. The Americans were much better. RBTH: Would you like to open a restaurant abroad again? A.K. : There are a few offers – from London, Monaco and Montreux. I’m still thinking. Konstantin Makridin, head chef of the Kremlin kitchen, discusses what the powerful like to eat. And how to please the president.